Philadelphia 76ers forward Robert Covington reacts in front of fans after a score against the Miami Heat during the fourth quarter in game one of the first round of the 2018 NBA Playoffs at Wells Fargo Center. It wouldn't be a Sixers offseason without a surprise surgery to kick things off. 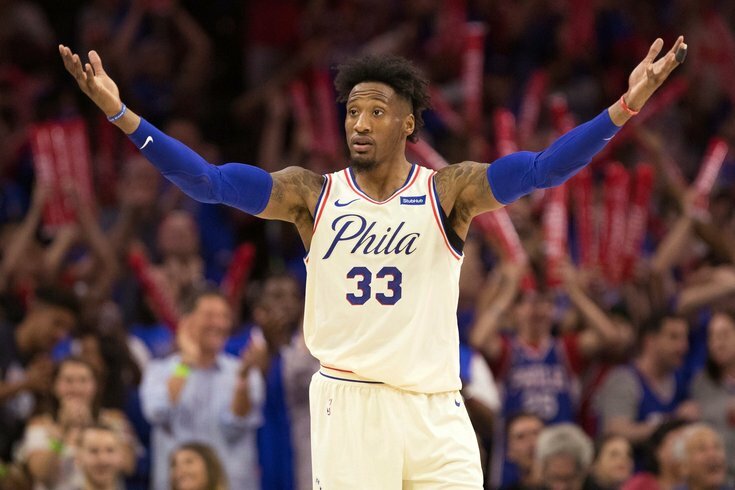 According to a press release from the team, the latest recipient of a procedure is forward Robert Covington, who underwent surgery to repair the extensor tendon in his left middle finger. The procedure — which was performed by Dr. Asif M. Ilyas, a hand surgeon at Rothman Institute and a Professor of Orthopedic Surgery at Thomas Jefferson University — was necessary following an injury to his hand the team says Covington suffered on December 28 during a west coast trip to Portland. Stop me if you've heard this before: the Sixers say Covington will wear a splint during his recovery timeframe and be reevaluated in two to three weeks. One of the ongoing storylines among fans this season was Covington's supposed drop off after he signed his new contract extension last November. If indeed Covington suffered an injury to his hand back in December, theoretically it could explain the slump he went into for much of the season's second half. When you take a look at the numbers, there's evidence to suggest that's the case. It's worth noting here, of course, that Covington is a notoriously streaky shooter who goes through long lulls as it is. So while a damaged middle finger on his non-shooting hand might have provided some discomfort, it's certainly not a full explanation for his erratic play. Thankfully — at least for those of you who are fans of the work Covington does for Philadelphia — this appears to be a non-serious issue and one Covington will recover from fairly quickly.